Make well in the flour. Add oil, salt and little water.Mix well till crumbly. Add more water little by little, kneading into soft pliable dough. Cover with moist cloth, keep aside for 15-20 minutes. Beat dough on worksurface and knead again. Re-cover. Heat 3 tbsp. oil, add ginger, green chilli, garlic, coriander seeds. Stir fry for a minute, add onion, saute till light brown. Add coriander, lemon, turmeric, salt, red chilli, garam masala. Stir fry for 2 minutes, add potatoes. Stir further 2 minutes. Make a thin 5″ diam. round with some dough. Cut into two halves. Run a moist finger along diameter. Join and press together to make a cone. Place a tbsp. of filling in the cone and seal third side as above. Make five to six. Put in hot oil, deep fry on low to medium till light brown. Do not fry on high, or the samosas will turn out oily and soggy. Drain on rack or kitchen paper. Serve hot with green and tamarind chutneys (refer chutneys), or tomato sauce. 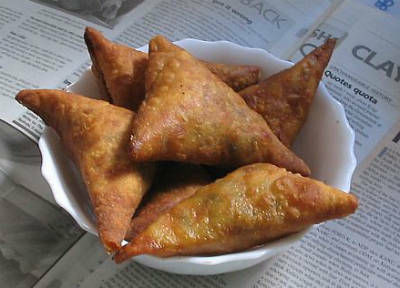 Feel free to comment or share your thoughts on this Samosa Recipe from Awesome Cuisine.